I slept late, glad to have the night shifts behind me.. My final shift in my job will be a single night shift on the 30th May..
At lunchtime I met up with an old friend for a drink and a pub meal in 'The Dirty Duck' in Holywood. I hadn't seen him in years and it was wonderful to share our experiences as well as our memories, made all the more poignant as I'll soon be leaving these shores.. All the best Steve! This evening I met up with some other friends with whom I'm planning a wild camping trip in Donegal next weekend. We were taking the time to organise the sea kayaks and get all the equipment in order. 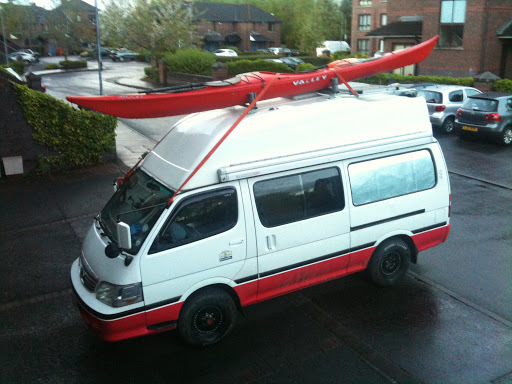 I also had to load my kayak onto the roof of the van, using the winch system my friend made up for me. I'll do a video on that process some time - getting a kayak onto the high roof is one thing, and doing it single handed for my Scotland trip will be another. I need to practice using the winch and strapping it on until I'm really confident doing it without a helper. I'll drive around with it there a few days and also practice the loading/unloading until its second nature. All the kayaking gear stores away nicely in the hatches on the boat itself - saving a lot of space in the van.